ANDERSON, S.C. (February 22, 2018) –The National Dropout Prevention Center (NDPC) announces the establishment of the Jay Smink Lifetime Achievement Award in Dropout Prevention. Because of his immeasurable impact on dropout prevention, intervention, and recovery, NDPC has named Dr. Jay Smink as the award’s inaugural recipient. The award will be presented annually to individuals who have made a significant impact in dropout prevention as a longtime partner of the National Dropout Prevention Center. Dr. Smink’s long and distinguished career includes a strong background in public education programs at the state and local levels. He conducted numerous national and regional workshops for administrators and teachers on a wide range of instructional, management, and leadership issues and was a frequent guest on television and radio talk shows. He is the author of journal articles, newsletters, and numerous professional monographs and books on a wide range of topics, including research, school reform, and teaching skills to assist students with basic academic skills. His publications include coauthoring the best-selling book Helping Students Graduate. His national leadership and authority on truancy and dropout prevention, mentoring, alternative schools, after-school programs, learning styles, service-learning, school-to-work, vocational education research, safe school environments, project evaluation and accountability, education marketing and dissemination, and program management secured his professional status as a well-respected leader in dropout prevention. Dr. Smink served as executive director of the National Dropout Prevention Center for 24 years and was awarded professor emeritus in Clemson University’s College of Health, Education, and Human Development. His career also included classroom teaching in public schools, leadership positions in state agencies, and research and administrative positions in the national career and technical education center at The Ohio State University. After retiring as executive director of the National Dropout Prevention Center in 2011, he continues to impact dropout prevention efforts in countless schools nationwide. His work in dropout prevention led to the identification of 15 Effective Strategies for Dropout Prevention that can and do have a positive effect on the challenge of dropouts. The importance of these strategies is recognized nationwide as guidelines for school improvement and at-risk student intervention. They continue to be the foundation on which the NDPC operates, resulting in his lasting legacy to education and, more important, to helping at-risk youth graduate. Dr. Smink served on numerous national and state boards, including the American Bar Association Advisory Commission on Youth Alcohol and Other Drug Problems, National Association for Industry-Education Cooperative, the National Mentoring Partnership, the Center for Career and Technical Education at The Ohio State University, and the South Carolina Commission on National and Community Service. In 2013, in recognition of his service to dropout prevention, recovery, and reentry, Dr. Smink was awarded the Governor and Mrs. Richard W. Riley Award for significant contributions to the advancement of dropout prevention initiatives in the state of South Carolina. In addition, in 2006, Dr. Smink was presented the National Dropout Prevention Center’s Crystal Star Award of Excellence Distinguished Leadership and Service award. It is with pleasure that the National Dropout Prevention Center once again recognizes the far-reaching impact of Dr. Jay Smink’s work through the establishment of the Jay Smink Lifetime Achievement Award in Dropout Prevention and naming Dr. Smink as its inaugural recipient. Established in 1986 with a mission to reduce dropout rates, the NDPC shares solutions for student success and dropout prevention through its clearinghouse function, active research and evaluation projects, publications, and a variety of professional development activities and conferences. The organization’s website—www.dropoutprevention.org—is the nation’s leading resource in providing effective, research-based solutions to engaging students and reducing dropout. 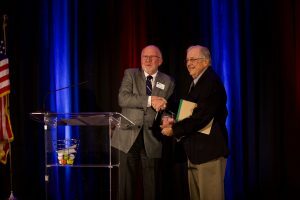 Photo caption: Dr. Sandy Addis (left) presents Jay Smink with the inaugural Jay Smink Lifetime Achievement Award in Dropout Prevention at the 2018 At-Risk Youth National FORUM in Myrtle Beach, SC.